In computer science and computer programming, a data type or simply type is an attribute of data which tells the compiler or interpreter how the programmer intends to use the data. Most programming languages support common data types of real, integer and boolean. A data type constrains the values that an expression, such as a variable or a function, might take. This data type defines the operations that can be done on the data, the meaning of the data, and the way values of that type can be stored. A type of value from which an expression may take its value. 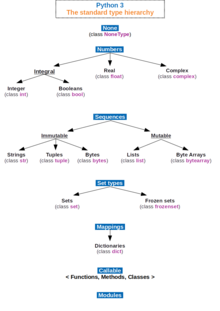 Primitive data types are typically types that are built-in or basic to a language implementation.
. Because of two's complement, the machine language and machine doesn't need to distinguish between these unsigned and signed data types for the most part. Floating point numbers used for floating point arithmetic use a different interpretation of the bits in a word. See: https://en.wikipedia.org/wiki/Floating-point_arithmetic for details. The Boolean type represents the values true and false. Although only two values are possible, they are rarely implemented as a single binary digit for efficiency reasons. Many programming languages do not have an explicit Boolean type, instead interpreting (for instance) 0 as false and other values as true. Boolean data refers to the logical structure of how the language is interpreted to the machine language. In this case a Boolean 0 refers to the logic False. True is always a non zero, especially a one which is known as Boolean 1. The integer data types, or "non-fractional numbers". May be sub-typed according to their ability to contain negative values (e.g. unsigned in C and C++). May also have a small number of predefined subtypes (such as short and long in C/C++); or allow users to freely define subranges such as 1..12 (e.g. Pascal/Ada). Floating point data types, usually represent values as high-precision fractional values (rational numbers, mathematically), but are sometimes misleadingly called reals (evocative of mathematical real numbers). They usually have predefined limits on both their maximum values and their precision. Typically stored internally in the form a × 2b (where a and b are integers), but displayed in familiar decimal form. An array (also called vector, list, or sequence) stores a number of elements and provide random access to individual elements. The elements of an array are typically (but not in all contexts) required to be of the same type. Arrays may be fixed-length or expandable. Indices into an array are typically required to be integers (if not, one may stress this relaxation by speaking about an associative array) from a specific range (if not all indices in that range correspond to elements, it may be a sparse array). A tagged union (also called a variant, variant record, discriminated union, or disjoint union) contains an additional field indicating its current type for enhanced type safety. Many others are possible, but they tend to be further variations and compounds of the above. For example a linked list can store the same data as an array, but provides sequential access rather than random and is built up of records in dynamic memory; though arguably a data structure rather than a type per se, it is also common and distinct enough that including it in a discussion of composite types can be justified. Note: strings are not a primitive in all languages, for instance in C, they are composed from an array of characters. A type system associates types with computed values. By examining the flow of these values, a type system attempts to prove that no type errors can occur. The type system in question determines what constitutes a type error, but a type system generally seeks to guarantee that operations expecting a certain kind of value are not used with values for which that operation does not make sense. ^ Shaffer, C. A. (2011). Data Structures & Algorithm Analysis in C++ (3rd ed.). Mineola, NY: Dover. 1.2. ISBN 978-0-486-48582-9. Cardelli, Luca; Wegner, Peter (December 1985). "On Understanding Types, Data Abstraction, and Polymorphism" (PDF). ACM Computing Surveys. 17 (4): 471–523. CiteSeerX 10.1.1.117.695. doi:10.1145/6041.6042. ISSN 0360-0300. Cleaveland, J. Craig (1986). An Introduction to Data Types. Addison-Wesley. ISBN 978-0201119404.